Recognition of Compliance is issued on the basis of audits carried out under the following scheme. The company applying compile the checklists of Request for Evaluation, which provides information to the Body of Control and allows the company to assess whether it can meet the requirements for recognition. The company will send the check list compiled with all required documents, which will then be examined by the Body of Control. 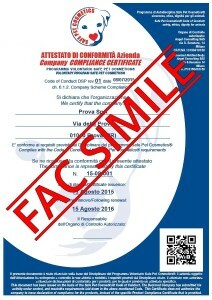 Among the documents requested, there are a list and description of the products that the company intends to propose for the Recognition of Compliance of the Product, the description of the organization, the detailed description of the production chain, the description of how the company demonstrates its commitment to protecting the health and respect for the animal. In cases where there are uncertainties regarding the documentation, audits will be conducted by the requesting organization or at one of the significant sites of the production chain. No additional costs will be asked to the company to conduct the audit. If the informations sent will be complete and reliable, will be provided, by sending with PEC, the Certificate of Recognition of Compliance of Company Scheme, the authorization to use the logo to certify the recognition of the company and the QR code that can be used to provide more informations to consumers (see the chapter concerning the use of QR code). Following the Recognition of Compliance of Company Scheme will be asked specific documentation by the Body of Control, concerning compliance and consistency with the principles described in the disciplinary. In cases where there are uncertainties or doubts about the documentation, the Body of Control will express its reservations indicating the necessary actions (change of composition, implementation of the information and tests), or may require the receipt of representative samples to lead the analysis considered relevant to lift the reserve. At the end of the evaluation process, it will be provided with a Certificate of Recognition of Compliance of the Product, by sending with PEC, the authorization to use the logo to certify the recognition of the product and the QR code that can be used to provide more informations to consumers (see the section regarding the use of QR code). Safe Pet Cosmetics is owned by Dr. Matteo Zanotti Russo.